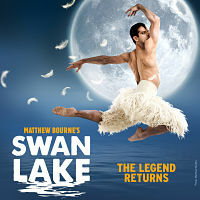 Musical Theatre News: Casting for UK tour of Matthew Bourne’s new production of “SWAN LAKE”. Casting for UK tour of Matthew Bourne’s new production of “SWAN LAKE”. New Adventures have just announced casting for the UK tour of Matthew Bourne’s new production of his legendary “SWAN LAKE”. The show will tour for 32 weeks throughout the UK and kick off at the Theatre Royal Plymouth on Saturday 22 September 2018, ahead of an eight-week Christmas season at Sadler’s Wells from Tuesday 4 December to Sunday 27 January 2019. Royal Ballet rising star, Matthew Ball, will be joining New Adventures for the entire London season of Matthew Bourne’s “SWAN LAKE” at Sadler’s Wells in the role of ‘The Swan’. Matthew will be making his debut with New Adventures and will dance four performances each week during the eight-week season at Sadler’s Wells. He is currently making his debut as ‘Prince Siegfried’ in The Royal Ballet’s new production of “Swan Lake” at the Royal Opera House. Matthew Ball joins New Adventures’ star Will Bozier, currently dancing to great acclaim as ‘Harry, the Pilot’, in Matthew Bourne’s “Cinderella” and former English National Ballet star Max Westwell who was also recently seen in the West End in “An American in Paris”. Will and Max are both making their debuts in the role of ‘The Swan’ and will perform throughout the tour. Both returning to the role of ‘The Prince’, two much loved New Adventures Principal dancers, Liam Mower (currently wowing audiences as ‘The Angel’ in “Cinderella”) and Dominic North (acclaimed star of “Edward Scissorhands”, “The Car Man”, “Sleeping Beauty”, “The Red Shoes” and currently “Cinderella”). They are joined by New Adventures’ newcomer, James Lovell who is making his professional debut. ‘The Queen’ will be performed by two long-time New Adventures favourites, Nicole Kabera and Katrina Lyndon both making their debuts in this role. ‘The Girlfriend’ will also be performed by Katrina Lyndon. She is joined by Freya Field and Carrie Willis who are both returning to the Swan Lake Company. ‘The Private Secretary’ will be played by long-time Company Principal Glenn Graham (recently seen as ‘Grischa’ in “The Red Shoes”) along with Max Westwell and Ashley-Jordon Packer. Returning to New Adventures are Tom Broderick, PJ Hurst and Alex Sturman. Making their debuts with New Adventures are: Nicole Alphonce, Leigh Alderson, Jonathan Luke Baker, Alistair Beattie, Benjamin Bazeley, Megan Cameron, João Castro, Zanna Cornelis, Kayla Collymore, Keenan Fletcher, Michaela Guibarra, Bryony Harrison, Nicholas Keegan, Shoko Ito, Courtney Liu, Jack Mitchell, Barnaby Quarendon, Jack William Parry, Sam Salter, Stan West and Milwhynne Williams. Also making their New Adventures debut are Andrew Ashton from Newcastle, Isaac Bowry from Glasgow and Harry Ondrak-Wright from Birmingham who all performed in the acclaimed New Adventures production of Lord of the Flies in 2014. Matthew Bourne said today “With the largest cast in our repertory, Swan Lake always gives us the opportunity to bring a wealth of new talent into the Company and I’m excited to welcome so many new dancers into the New Adventures family. I’m particularly thrilled to welcome cast members whose journey to this production came via our production of “Lord of the Flies” or through our “Swan School” which was designed to develop young talent for this company. My thanks also to Royal Ballet Director, Kevin O’Hare, who was as enthusiastic as I was about seeing Royal Ballet star, Matthew Ball, dance this role, and was instrumental in making that happen”.